Robert H. Lee was born in Vancouver and educated at the University of British Columbia. His career has combined outstanding achievements in the business world with philanthropy and community service. He has been an outstanding contributor to the expansion of Canadian business within the Pacific Rim region. His reputation for excellence and integrity are recognized by all who have dealings with him. His stature in the business community includes appointments as trustee of the Bank of British Columbia, a directorship of the Real Estate Institute of Canada and of the Port Authority of Vancouver. Mr. Lee’s business acumen and knowledge have enabled him to play a key role with a number of community institutions. He has been involved with successful fundraising campaigns for Mount Saint Joseph Hospital, the B.C. Children’s Hospital and U.B.C. He has also served as a Director of the B.C. Paraplegic Foundation. His long-standing association with U.B.C. has included membership on its Board of Governors and a directorship on the U.B.C. Foundation. Mr. Lee has also received his alma mater’s Distinguished Alumni Award. 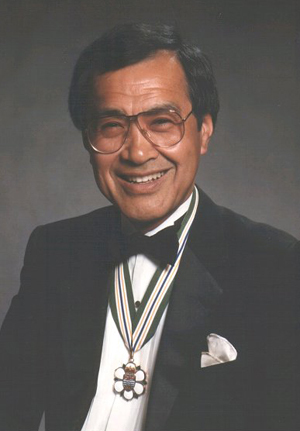 He has recently been selected Business Person of the Year for 1990 by a panel of judges drawn from the Chinese-Canadian business community and the Vancouver Board of Trade. His standing in the business community, combined with his dedication to volunteer service and his exemplary character, makes Robert Lee a role model to all who know him.